You should receive an e-mail shortly with the details for downloading your eBooks. Be sure to check your spam/junk/promotions folder in case you don’t see the email within 15 minutes. To avoid my emails ending up in your junk folder, please add my email address to your whitelist. For details on how to do this, just tap here. 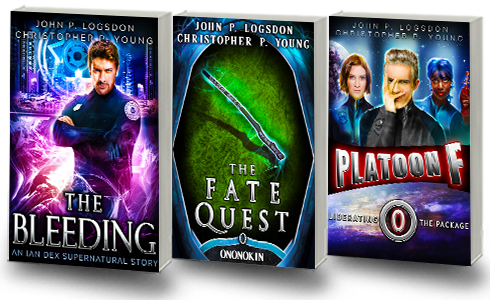 Note that my email address is john@johnplogsdon.com. Get the Ian Dex Box Set and Save! 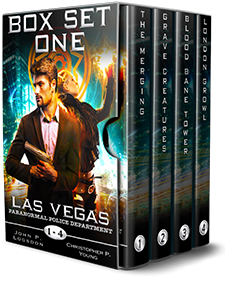 Snap up the first 4 book in the Las Vegas Paranormal Police Department and save a few bucks as you follow Ian Dex and his team through these action-packed, hilarious adventures! I got this when a friend recommended it. I couldn’t put it down! It’s supernatural, funny, hilarious and keeps you hooked. Lots of action and destruction in every book. Great pacing as well . It even packs a nice bit of comedy into the mix. ( What can you expect when one of the minor characters is a talking male member named The Admiral. ) Throw in a foul mouthed Pixie and we are off to the comedy races. Irreverent comedy and continuous action. The darkness reimagined, shades of gray versus right and wrong. Oversexed James Bond mixed with MR. BEAN. What can I say? These books are different than any other I have read in the fantasy/humor style. Saying they are funny doesn’t do it justice! Do yourself a favor and give it a read, you won’t be disappointed! 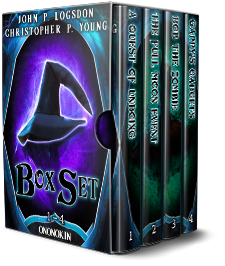 Zombies and wizards and werewolves, oh my! These are all books, imaginative and lovable characters. Meet Gappy the tinkering goblin, Whizzfiddle the wizard whose super powers are fueled by beer ( not that uncommon in our world, a lot of my friends feel more magical after a few brews ), and watch a home improvement show in the making, run by rather inept demigods. You’re gonna love these books. Take this opportunity to snag all the current missions from the absurd Platoon F series. It’s fun, it’s crazy, and it’s a barrel of laughs. Yep, it’s silly, preposterous, and totally unbelievable. But it’s a barrel of fun.